Isabelle Glimcher was born and raised in New York City, and received her bachelor's degree in Social Studies from Harvard University in 2013. While there, she focused on issues of international law, human rights, and modern political philosophy, and worked for the Center for International Development at the Kennedy School. Her senior thesis explored the theoretical boundaries of the relationship between the state and the citizen. Building on previous work with the International Rescue Committee, Isabelle then attended Oxford University, where she earned a master's degree in Refugee and Forced Migration Studies. 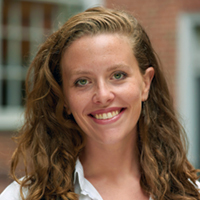 Her master's thesis explored the administration of law and order in a Ghanaian refugee camp. Since then, Isabelle has served as a paralegal in a trial division of the New York County District Attorney's Office. At NYU, she plans to explore international criminal law, humanitarian law, refugee law, and national security law.